Hearts is a classic card game now you can play it online on your computer, mobile, or tablet. Compete with 3 other AI players. The goal is to get as few points as possible. Game ends when someone reaches 100 points. The player with the lowest score wins. So would you be able to win? This game is one of our board games at Round Games. You can play this game on all devices. 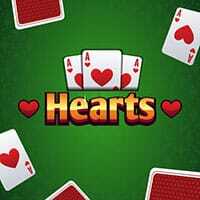 Enjoy and have fun in playing Hearts Card Game. Good luck. Also make sure to check out Cribbage Card Game and Classic Solitaire Game. You may enjoy playing it.